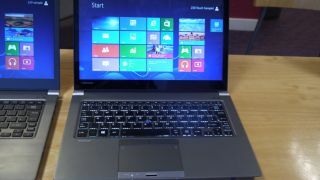 Toshiba has come to the rescue of executives hacked off by short battery life by adding Intel's Broadwell chips into its range of enterprise-class laptops. Arriving in UK stores today, the 13-inch Portégé Z30, 14-inch Tecra Z40 and 15-inch Satellite Pro R50-B can now benefit from fifth-generation Intel Core processors that bring with them a jolt in battery life and improved mobility. The biggest benefactor is the Portégé Z30 that sees battery life move up from 13.5 to 17 hours and not far behind that is the Tecra Z40 that gets an uplift from 10.5 to 15 hours. That's not all as the Satellite Pro R50-B, which was thus far not known as a long-lasting laptop, now delivers up to eight hours of life. Adding Broadwell to the range means that it's now conceivable for the Portégé Z30 and Tecra Z40 to last for two full working days without needing to be plugged in and Toshiba will hope that this makes it a boon among workers that are constantly on the move. The Portégé Z30 and Tecra Z40 were unveiled way back in October 2013 and are geared towards premium business users and apart from the new processor retain all the original features from their launch. The Satellite Pro R50-B caters to small and medium sized businesses that want a reliable and affordable offering, and the uplift in battery makes it an attractive machine. Options across the entire trio range from the Core i3 all the way up to the Core i7 and are available at retailers now.